Feeling a bit poorly this evening :-( really achey and i've got a sore throat and headache and stuff... so you'll have to excuse my vague ramblings! If you're a regular visitor the the fantastic Print Pattern blog, you'll know that it's a hive of on trend homefurnishings, fashion, stationary and paper goods. So when today it features a fabulous brand known as Papermania and some fantastic Spring and Easter ranges, you'll know you're in good company! Very exciting! I'm so happy and a tad amazed that i've nearly reached two whole months of my Picture-A-Day! 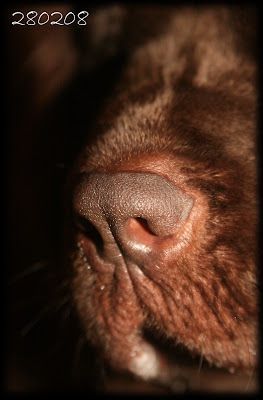 Today is a lovely close up of Martha's snout! Love the texture on her nose! Ohhh that blog! I have never seen it before and it makes me want to run to Paperchase!